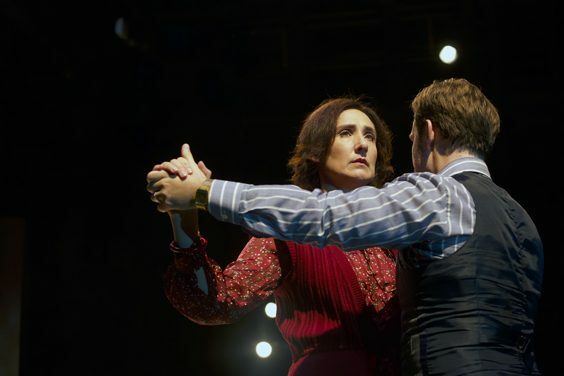 Abigail's Party – Review – Hull Truck Theatre, October 2018. It feels quite remarkable, and a little scary, that it’s more than 40 years since Mike Leigh’s ‘Play for Today’ Abigail’s Party was broadcast on BBC TV. 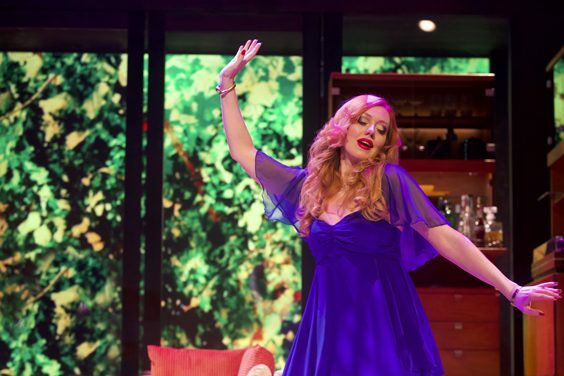 The play made a star of Alison Steadman, brought a side to suburbia that wasn’t seen in The Good Life to the attention of the nation, and gave the music of Demis Roussos perhaps a longer lasting legacy than it deserved. Staging such an iconic play in this day and age is quite a challenge, but this production at Hull Truck Theatre, directed by Amanda Huxtable, was a joy to watch from start to finish. I say joy, but of course it’s also hugely frustrating, as most, if not all, of the characters seriously get on your nerves at some point. But, then again, that’s exactly the point. This is a story that makes you constantly challenge the way you think, sympathising with, mocking and despising the self-same characters at different points of the evening in question. The cheesy 70s pop tunes welcome the audience ahead of the play, with the simple set evoking the time perfectly, drinks cabinet and neon light firmly in place, along with that staple of any 70s soiree – pineapple on sticks. Even with the best writing in the world and an evocation of time and place, any production of Abigail’s Party will stand or fall on the lead character of Beverly, who is on stage in front of us for the vast majority of the evening, including at the very beginning as she prepares her home and herself for the opportunity to show off to her guests. It’s a difficult role to pull off and to give the audience so many emotions to contend, but Katharine Bennett-Fox was quite outstanding. Irritating and engaging in equal measure, funny yet ridiculous, shallow but with deep insecurities that emerge from time to time as events spiral out of control. Bennett-Fox captivates with her performance, staying the right side of parody and making you feel sympathy for such a vain and self-centred person, shimmying around the stage as if it were a catwalk. Which in many ways, to Beverly’s way of thinking, it actually is. I invariably enjoy plays with a small number of cast members, but that also makes it so much more important that every one of them contributes fully and looks right for the part. Again, in this five-person play, the casting is spot on. While it’s hard to completely like any of them, certainly not for the whole evening, it’s the wonderful Ani Nelson as Angie who comes closest to stealing the spotlight from Bennett-Fox. With Beverly’s husband Laurence absent for much of the first half and singleton friend Susan too meek to be engaging, it’s down to Angie to provide much of the self-deprecating humour and possibly also be the only one of the five that you would actually want to spend time with at such an occasion. As the gin and tonics flow and the party held by Susan’s daughter Abigail starts to get out of control across the road, the façade of respectability begins to slip, and true feelings come to the surface. The mark of the greatness of Mike Leigh’s script is that it can be slotted into 2018 as well as it could back in 1977. Some of the issues may have changed a little, but scratch a little harder, and essentially they are still there – testing perceptions of class, race, social mobility, aspiration and downright decent manners. This production takes those initial issues and plays with them enough to make you feel this could, in many ways, be set this year, when so much social upheaval seems to be tearing the nation apart. The beauty of Huxtable’s adaptation is that it allows the characters to develop without them turning into caricatures of themselves. That in turn leaves the audience almost feeling guilty for liking Beverly and finding her funny, while at the same time making you feel as though you really don’t know her at all. 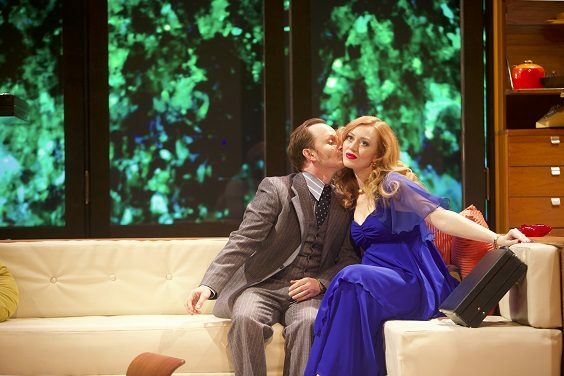 For that, and Bennett-Fox’s performance alone, this production of Abigail’s Party is a must-see.